After his initiation from Shri Krishna himself, the first song Venkata Kavi composed is the famous “Aadathi Ashangaathu Va Kanna” in the auspicious Madhyamavathi Raga. This song consists of a lot of literary and musical beauties, and in this song, he gives references even to Shaivite Gods. The anupallavi of the song “Adalaik-kANat-tillai ambalattiraivanum tan Adalai viTTu ingE gOkulam vandAr AdalinAl shiru yAdavanE oru mAmiyilirakaNi mAdhavanE nI” refers to Lord Shiva Himself coming to the Oothukadu Kalinga Narthana temple to visualize the Dance of The young Krishna. Similarly, the Charanam of the song has a line “panniru kai iraivan Erumayil onru”, where he mentions Lord Murugan. 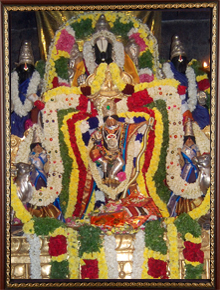 The popular song “Alaipayuthe” was sung in the last moments of Venkata Kavi, where one can see an emotional outpour of the disappointment of not getting Krishna’s Darshan all through his life. According to legends, it was at this very instant that he was able to feel a child in his lap, and with old age hampering with his eyesight, he could only ask for the whereabouts of the child, to which the child would not reply. Later, when he tries to push the child from his lap, the child tells that He is the one, whom Venkata Kavi was craving for, all his life, and that the child has come to take the poet to his abode, Vaikuntham. Another of Venkata Kavi’s popular songs “Thaye Yashoda” in Thodi, is part of an opera on Lord Krishna, where Venkata Kavi depicts beautifully, the claims and the complaints that the Gopikas place in front of Krishna’s mother, Yashodha. The very next song in the opera is “Illai, Illai, Illai Amma” in Mohanam, whre Venkata Kavi visualizes himself as Lord Krishna, and in extreme beauty and innocence pleads to His mother Yashoda, asking her not to believe those complaints. In Venkata Kavi’s first song “Aadathu Ashangathu Va”, the opening lines of the Charanam state that The dance of the small feet of the Lord is so melodious that the poet would come again as a rebirth to experience it. And rightly as referenced, the poet (Narada), after shedding the mortal coil, did reappear as Venkata Kavi in the same place, and on the Lord’s behest composed the evergreen majestic Thillana in GambheeraNattai, wo match the rhythmic steps of the Lord. 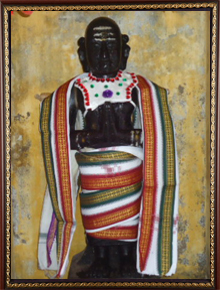 At one stage when the poet could no longer compose, the Lord transfigured into an idol, which is what one sees as the Uthsava Murthy in the Kalinga Narthana Swamy temple. Venkata Kavi's songs can be divided into Bhakti and Gnana Marga, the former depicted by Tamil songs that even laymen can understand, following the traditional Kavadi chindhu style, and the Tamil folk ragas such as Senjurutti, Punnagavarali, Nadanamakriya, Kamboji, Arabhi etc. Gnana Margam has been depicted in Sanskrit songs in rare ragas like Lalithagandharvam, Balahamsa etc, employing intricate Sanskrit language. Given below are a few of the examples that give a glimpse of the scholarly approach of Shri Venkata Kavi, which one can easily experience by merely listening to his Krithis. Shri Venkata Kavi has composed in various musical forms right from the scholarly kriti to the rustic kavadichindu. He has followed both paths of Jnana Marga and Bhakthi Marga, the former being seen in his Navavarna and other Krithis, mostly in Sanskrit and the latter in famous Krithis like Alaipayudhey, Thaye Yashoda, etc in Tamil. He was very well-versed in various Ragas (musical Scales) and has used a lot of popular Ragas (such as Kalyani, Kambhoji etc) as well as rare Ragas (such as Balahamsa, Lalithagandharvam etc) in His Krithis. He has also employed the Raga Mudra, where the Krithi bears the name of the raga used. He was also well-versed with the swaras and the relationships between them, as one sees lot of Vadi-Samvadi (Perfect Fifths and Fourths) relationships employed in his songs. Venkata Kavi has also composed shlokas, Sthuthis and poems, and even metric pieces similar to Thiruppugaz. One can also see the scholarly genius in Venkata Kavi, who was very well-versed in Thala (Rhythm cycles), and in His Krithis, is seen periodic structural arrangements such as the Thala cycles ratio being proportional like 2:2:4 (pallavi:anupallavi:charanam). Also in such Krithis like Senapathe in Gowla, we can see deshadi and Ateeta Thalas being used, which show the poet’s capability to handle such exotic rhythms. He has also used Madhyamakala sections (fast sections) in his songs, again considered to be one of the earliest in this. 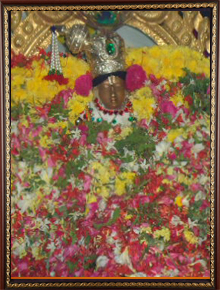 Examples can be seen in Mahashaya Hrudaya in Abhogi and the eighth Avarana, Shankari Shri Rajarajeshwari in Madhyamavathi. In Mahashaya Hrudaya we can see yet another aspect of the poet’s creativity, where he has employed variations in the Madhyamakala Sahitya couplet, retaining the first line and changing the second. Another facet of this genius is in his usage of Swaraksharas (lyrics matching the Solfiege), as seen in Sarasijabhava jaye in Kalyani. But all this seems trivial when one starts to explore the Thalas and Gathis that Venkata Kavi has used. He has used complicated Thalas like Khanda Dhruvam and Sankeerna Matyam and also Gathi shifts with such disdain that one could see the Divine intervention of Shri Kalinga Narthana Swami’s rhythmic feet. Venkata Kavi has also used Yati or lyrical patterns, yet another rarity in Carnatic music. When one starts to see the lyrics in Venkata Kavi’s compositions, one wonders in awe at the lyrical beauties. He has used unparalleled poetry, rhyme and alliteration in his lyrics. His play with the Navarasas (9 emotions) are akin to Lord Manmatha’s (Cupid) play with the five flowery arrows. The poet has also made lots of references to great saints, incarnations and poets before his time, and one can see as the saying goes “the union of the Devotee, God and Devotion”. A careful observation of such scholarly aspects in his Krithis clearly indicates that Shri Venkata Kavi was a scholarly composer par excellence, and such creativity could come only through the grace of the Lord, Shri Kalinga Narthana Swami, and who else but Venkata Kavi, the sage Narada incarnate, could praise the God in such detail! Even today, the presence of Shri Venkata Kavi and the Gopikas can be felt in the temple, and one can listen to their soothing lilting melodies every night In the temple.